More photos of our garden - back yard. Ken and I have hosted an Australia Day party every year at our home for many years (except last year when Ken was ill). We are both very patriotic, and I love to dress up our house with the Aussie flag and other items featuring icons relating to Australia. 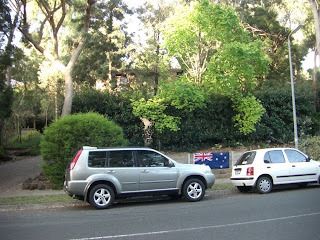 This year I bought a huge flag at Aldi's, and tacked it on the fence outside our home. Ken said I was crazy, it would get stolen, but I had more faith in my fellow Australians, and it stayed there until I took it off about 7 pm that night. What a disgraceful effort against our country's leading politicians! When are the aborigines going to accept that we are all Australians? The human race has been migrating around this planet, and occupying other human tribal lands for tens of thousands of years. It's not new, and it's not very nice, but is IS a natural process. We can all make the effort to love this country together, or we can let the situation degenerate into the mess we saw yesterday. 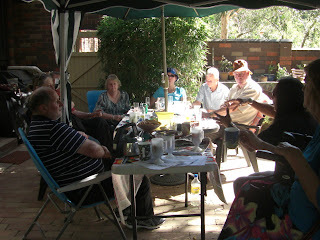 In the meantime, we enjoyed ourselves with a dozen friends in our backyard, on a perfect sunny day. No BBQ (too hot! ), but delicious cold salads, scrumptious desserts, and freely flowing bubbly wine, beer and soft drinks. I was so busy I forgot to take photos until the last minute, and only got one or two reasonable ones. 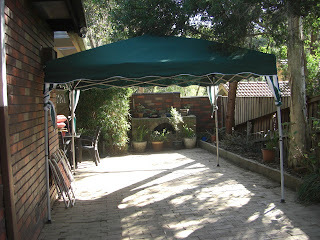 Here are some of our mates relaxing under our new gazebo. This is the gazebo the next day - we are leaving it standing for the next few days, as the weather forecast is hot, and it will help to keep that side of the house a bit cooler. Looks like you had a lovely day, Gina ... we were off camping, but I had my flag hanging !!! glad you had a lovely Australia day! shame about what happened with the PM and Tony. acting in a disgraceful manner certainly does no one any favours. sigh! we had a flag last year but stopped flying it as it often attracted racist abuse at us [apparently in tassie asians cannot be australian] which is a shame as though I wasn't born here, I am so proud of Australia, it's such a beautiful country and I long to contribute to building it and making it even greater. Oh Cell, that is awful. I can't believe people would abuse you for flying the flag just because you are of Asian background. I am very sorry; it is embarrassing to hear that some fellow Aussies is so prejudiced. They don't deserve to be called Australian themselves. There was a letter in today's Sun from somebody who said that with all the people overseas knocking on our doors to get here, maybe flag burners should be sent to those countries in exchange. See how soon they want to come back here and be grateful, regardless of which flag is displayed.